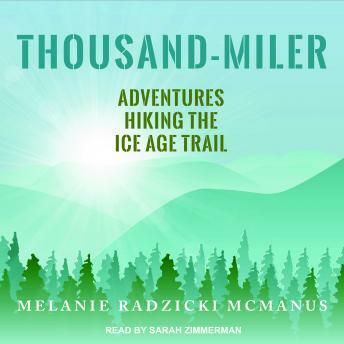 In thirty-six thrilling days, Melanie Radzicki McManus hiked 1,100 miles around Wisconsin, landing her in the elite group of Ice Age Trail thru-hikers known as the Thousand-Milers. In prose that's alternately harrowing and humorous, Thousand-Miler takes you with her through Wisconsin's forests, prairies, wetlands, and farms, past the geologic wonders carved by long-ago glaciers, and into the neighborhood bars and gathering places of far-flung small towns. Follow along as she worries about wildlife encounters, wonders if her injured feet will ever recover, and searches for an elusive fellow hiker known as Papa Bear. Woven throughout her account are details of the history of the still-developing Ice Age Trail-one of just eleven National Scenic Trails-and helpful insight and strategies for undertaking a successful thru-hike.